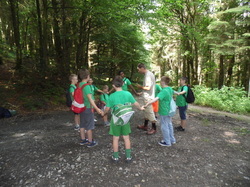 Camps and Fun - jttmonaghan.com FAILTE! WELCOME! This year's Eco Camp is being arranged for July 20 - 22nd. More details later. Our camps are organised with the assitance of the County Council Environment Officer. They focus on waste prevention, recycling, energy efficiency and biodiversity. 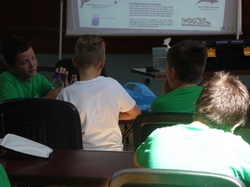 Eco Camp 2014 was attended by 26 children from Cluain Lorcain. Again the children went to both to Sliabh Beagh and Tanagh Outdoor Activity Centre for outdoor workshops as well as three days of workshops in St Patricks Hall in Monaghan Town. Everyone really enjoyed themselves and learned a lot. Eco Camp 2013 was attended by 25 children. Apart from really interesting workshops there was a trip to Sliabh Beagh and a day in Tanagh Outdoor Activity Centre. A fantastic week of fun for everyone! Many thanks to Elaine and Mary who supervised all week and to Nial for organising everything. All the hardworking kids in Killygoan were rewarded for their efforts with three days of eco related activities in the local community house, in Knockatallon and on the final day in Tanagh Outdoor Recreation Centre. Everyone learned a lot and had great fun too. Thank you to Niall O'Connor, Environment Officer, Monaghan County Council for his help and to Ann for doing all the hard work and organising on site. Photos on the way soon. The pioneers of the Monaghan Junior Tidy Towns movement were rewarded for over a year of hard work when they visited Tayto Park recently with group leaders and parents. A fantastic time was had by all as the children, ranging in age from 2 to 16, spent the day thoroughly enjoying themselves at all the attractions provided. Junior Tidy Towns continues to grow in Monaghan Town. Initiated by the residents of Cluain Lorcain on the Old Armagh Road, other groups in the town are now also flourishing. This, coupled with the fact that all primary schools in the town are now involved in the Green Schools programme, bodes well for the future of the area. Junior Tidy Towns are registered as an ECO UNESCO Club in Action and they will be showcasing their work at the National Youth ECO Forum later in the year. Junior Tidy Towns are supported by the Community Development Fund through Monaghan Tidy Towns. On Wednesday November 2nd 2011, as a well earned reward for the Children of Monaghan Junior Tidy Towns, a trip to the bowling alley in Castleblaney was organised As an added treat on the way they stopped at the recycling centre at Scotch Corner in Monaghan and were greeted by Mr Niall O Connor who gave them a guided tour of the plant explaining to each of them the importance of recycling and what actually happens to all the stuff that gets recycled on a daily basis. The children found this very interesting as there were plenty of things that could be recycled that they weren.t aware of. Even though it was a cold day the children enjoyed the tour of the recycling plant and they each received a goody bag on the way out. this was an added treat for them. then back on the bus to the bowling alley. The whole day was a great success, the bowling went really well and there was great competition between all the children to see who scored the highest in all the different teams. 32 of the children went on this day trip, it was great fun and added to the sense that all their hard work not only paid off in that the area where they live and the surrounding areas were benifiting form their efforts and hard work. it gave them all such a sense of pride to be part of the Cluain Lorcain Monaghan TIdy Towns.